How to measure the weight of the Earth? | Why Do We Do It? Well to answer the first question, regarding how much the Earth weighs? It weighs about 6E+24 kilograms or 6*10^24 kilograms or 6,000,000,000,000 ,000,000,000,000. 5.9736E+24 kilograms or 5.9736*10^24 kilograms. Now how does one even begin to calculate this weight? Well the concept of calculating this weight is through gravitational attraction between objects. As read on howstuffworks.com, every object attract every other. If we were to place 2 bowling balls next to each other, and we use a very sensitive measure, we can actually measure the gravitational force between them. 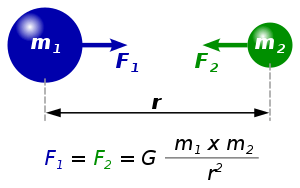 This combined with Newton’s expression for gravitational force between spherical objects, i.e. F = G * M1 * M2 / R, can help us determine the weight. Now we can measure the mass of the Earth, by assuming the other mass to be a 1 kg sphere. The force between them will be 9.8 kg m/s^2, which is the acceleration due to gravity. The R will be the radius of the Earth, which is 6,400,000 meters. So when we do plug-in all the values, we result with 6*10^24 kilograms. This entry was posted on March 21, 2011 by Avi. It was filed under 2011, March and was tagged with Earth, General Conference on Weights and Measures, Gravitation, gravitational force, International Bureau of Weights and Measures, Kilogram, Mass, Mass of Earth, Newtons formula, Physics, Weight, Weight of Earth.